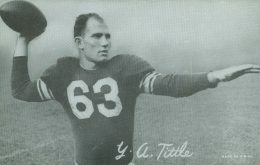 One of the NFL's first great throwing quarterbacks, Yelberton Abraham Tittle set a new statistical standard for passing yards and touchdowns, putting Y.A. Tittle football cards on the map. 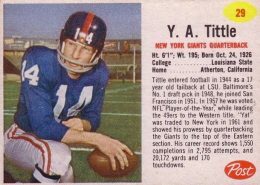 This list pays tribute to some of Tittle's best football cards, including popular appearances from later in his career while with the Giants. 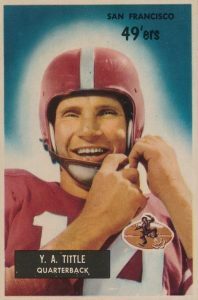 After becoming a college legend at quarterback for Louisiana State University (LSU), Tittle decided to join the All-America Football Conference (AAFC) instead of the NFL's Detroit Lions, who had drafted him in 1947. The competing football league went out of business in 1949 and Tittle was selected by the San Francisco 49ers in 1951. The 49ers offense was one of the most pass friendly ever to that point and Tittle set new QB production records. However, it was only after he was traded to the Giants that he found playoff success, taking the team to three straight NFL title games from 1961 to 1963. Although a hero to the San Francisco 49ers and New York Giants franchises, the Y.A. Tittle rookie card is actually from his brief time with the Baltimore Colts of the AAFC. Shop for Y.A. Tittle Autograph Cards on eBay. While the list is largely dominated by his earliest cards, a few other Y.A. Tittle cards of note include 1962 Topps Bucks, which featured him on a oddball card that looked like a $10 bill. In addition, the Kahn's Wieners company issued football cards from 1959 to 1964 and Tittle appears in the 1963 and 1964 sets as a Giant. For a more modern option, Tittle and Eli Manning played quarterback for the Giants 40 seasons apart, but both players are featured together on an autograph card in 2008 Upper Deck Premier. In 2008 SP Rookie Threads, Tittle is combined with Green Bay Packers running back Paul Hornung on a dual autograph. As the Y.A. Tittle cards from his early playing days are in some of the first nationally available football sets, they would be valuable if Tittle wasn't in the Pro Football Hall of Fame. Since he is, values are higher, but not unaffordable for most collectors. In building this list, card value was prioritized while design and hobby relevance was also considered. 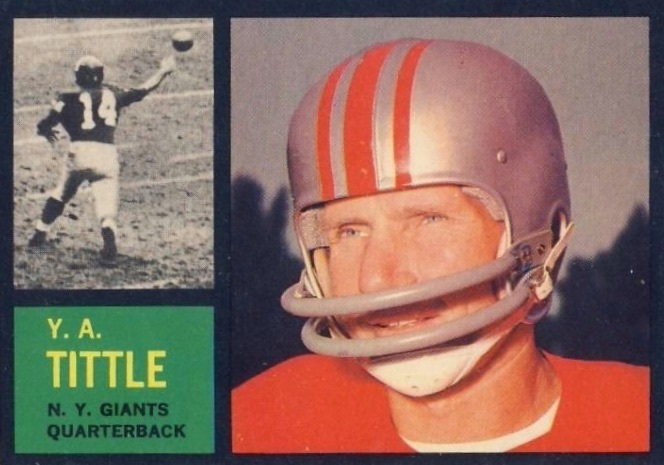 Even though he was traded to the team in 1961, Tittle finally made his full Topps debut as a Giant in the 1963 set. He would appear in one more Topps set during the following year (1964) before retiring. Because Topps organized their checklist in alphabetical order by team (at the time of release), Tittle and the rest of his Giants teammates are all short prints with Tittle's card being the highlight. One of the brightest vintage offerings for Tittle comes in 1957 Topps. The dual-image design features his 49ers days but with a vivid yellow, blue and red combo. The close-up image on the left is very similar to the 1955 Bowman card found later in the list. 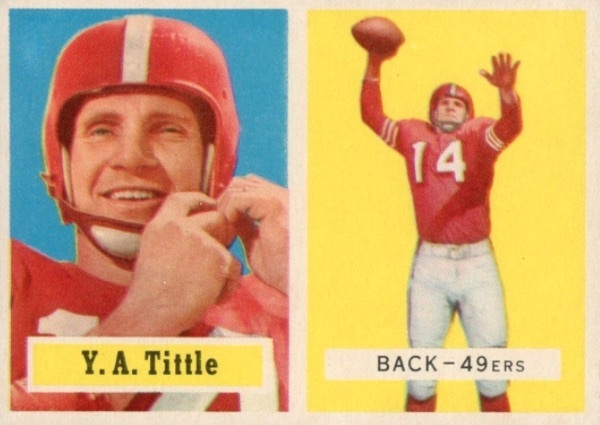 Although he is noted as the New York Giants quarterback on his 1962 Topps card, Tittle is still featured wearing his 49ers helmet. Typically Topps would airbrush or darken the hat for players who had changed teams in their baseball releases, but they left the helmet alone for Tittle's card. The horizontally-framed set features black borders and, like just about every other release to make that design decision, cards are hard to find in mint condition as nearly any mishandling becomes easily visible. This 1953 Bowman card features a portrait of Tittle at a dutch angle and the photo helps demonstrate how much football has changed since the 1950s. Tittle's Wilson helmet features no face mask and it doesn't look like it would hold up very well to the vicious hits in the modern game. 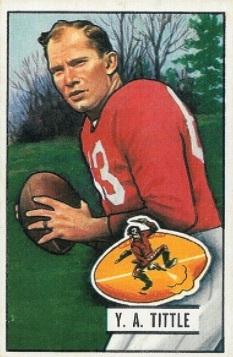 Bowman placed the player's name and team information inside a football and Topps would use a similar design a few years later for their 1960 football set. While Topps waited until 1963, the first Y.A. 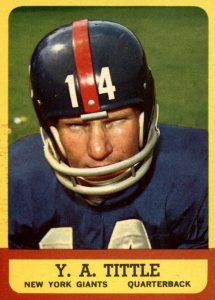 Tittle football card showcasing the silver and blue of the New York Giants uniform can be found in 1962 Post, making it one of his most popular releases. Part of the only Post football set, there were 200 cards issued in total. A seemingly random assortment of cards (though not Tittle's card) are extremely valuable as they were featured on boxes of Post cereal brands that weren't very popular. As a result, many of those cards were never freed by scissors from their cereal box prison, keeping supply low. The Y.A. Tittle 1952 Bowman cards can be found in two varieties: a large and small version. Collectors have placed a huge premium on the larger card, which is about 7/16" wider and 5/8" taller than the small version. 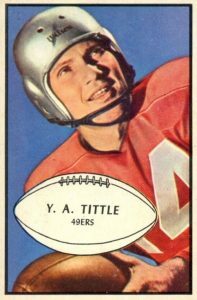 Tittle's card features his bright red 49ers jersey and his slicked back hair in a horizontal layout. 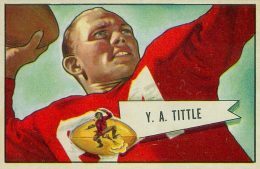 The 1952 set includes both horizontal and vertical cards with many quarterbacks shown throwing the football in the horizontal design. 1954 Bowman would utilize a nearly identical design but with the player's name flag pointing to the left. Although Y.A. Tittle autographs were issued before 1997 Upper Deck Legends, they were in sets like 1992 Pro Line Portraits, which featured him as a retired player wearing Pro Line brand clothing. 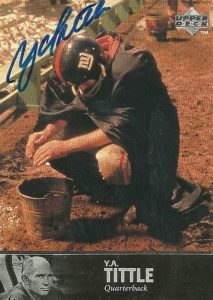 1997 Upper Deck NFL Legends presents Tittle during his time with the Giants as he tries to warm his hands while crouched in the mud. Tittle wisely autographed his cards in the upper-left corner as the blue signature would have been harder to pick out if he signed over his Giants jacket in the middle. 1955 Bowman was the last football set issued by the company before Topps purchased them in 1956. The design is beautiful with vibrant colors and a ghost-like halo around the player photos. Tittle's card features the QB attaching his chinstrap with a broad smile on his face, making it one of his best-looking cards. The set is divided between two groups (#1-#64 and #65-#160), with the first series being much easier to come upon. This gives the Tittle card a slight value bump because of the increased rarity. The first Y.A. Tittle football card came from the Exhibit Supply Company in 1948 while he was with the Baltimore Colts of the AAFC. Tittle's cards were issued in 1948 and 1950 and collectors could find them in vending machines at candy shops and general stores. Eagle-eyed collectors can differentiate between the issues by the size of the lettering used in the "Made in the U.S.A." text in the bottom-right of the card as the 1948 lettering is slightly larger. The black-and-white card is very beautiful in its simplicity and it is the only non-Bowman card from Tittle's days with the Colts. 1951 Bowman football shares a similar look to the '51 baseball design with the key difference being the football set adds team logos. Tittle is featured with the 49ers for the first time in the set. When Tittle joined the team he became part of the "Million Dollar Backfield" which included three future Hall of Fame running backs: Hugh McElhenny, John Henry Johnson, and Joe Perry. 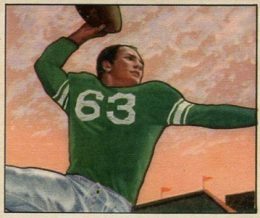 As 1950 Bowman doesn't feature any name or team information on the front of the card, finding Tittle's card might prove difficult if you didn't know the AAFC's Baltimore Colts franchise wore green jerseys. The Colts were arguably the worst team in the league and although they share the same name, they weren't connected to the Baltimore Colts franchise that started in the NFL in 1953. Besting Otto Graham, the Y.A. Tittle rookie card is the top RC in the set and the most valuable overall. Mint copies of the early Bowman football sets are virtually impossible to find and even excellent graded copies of Tittle's rookie approach $350 at auction. For those rare near-mint copies, prices can reach 10 times as much. 2016 DONRUSS SIGNATURE SERIES FOOTBALL PANINI Y A TITTLE AUTOGRAPH #9 10 Giants! 1997 Fleer Goudey John Elway Y.A. Tittle Says!! #7 (Broncos) Look!!! Hot!! Was in a random group break and got his absolute auto sunday ,the day he passed away. Is that his last certified auto? Mike V: Not necessarily. Many products are signed for months ahead, plus there could be tons of sticker autographs waiting for use.